What if you finally try moonlight rock climbing? What if you call your Uncle Ted out on his godawful toupee? What if you call in drunk-sorry, sick-to work on Friday? What if you get up the courage to tell your mom you actually hate her meatloaf? How different could your life be because of one seemingly innocuous choice? 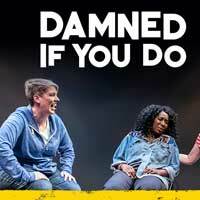 "...It takes a barrel full of skill and confidence to believe you can pull this off night after night and the four vaguely familiar faces in "Damned if You Do" have it. The most familiar of the four is the ostensible leader, Shannon O'Neill, the sidekick on TV's "Chris Gethard Show," who has an appealing deadpan demeanor, a good talk show host's way of bantering with interviewees and a genuine curiosity about people." "...The cast is comprised of “four beautiful women,” UCB Artistic Director Shannon O’Neill, Alex Dickson, Monique Moses, and Molly Thomas (though I sense future performances will make use of a fifth male cast member on the bill, Connor Ratliff). The show opens with our four performers, standing shoulder to shoulder under the glow of eerie green lights. In unison, they announce they know our future, what it could look like, and how it might be different due to one seemingly insignificant decision."